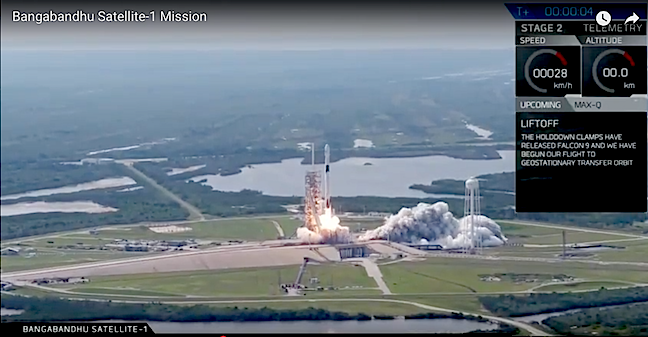 Thursday's abort of the SpaceX launch was easily forgotten as Friday, May 11's launch of Bangladeshi 's first satellite, Bangabandhu Satellite-1, aboard the Falcon 9 Block 5, went smoothly even to the 25th successful return of a SpaceX rocket booster. The liftoff occurred from Launch Complex 39A (LC-39A) at NASA’s Kennedy Space Center, Florida at 4:14 p.m. EDT and the Bangabandhu Satellite-1 was deployed into a geostationary transfer orbit (GTO) approximately 33 minutes after launch. The Falcon 9 Block 5 is a new 23-story tall giant rocket and spaceship combo, the BFR, for the first time taking into space the first high-orbit communications satellite ever for the country of Bangladesh. The Block 5 sports numerous upgrades designed to make the rocket easier to reuse. 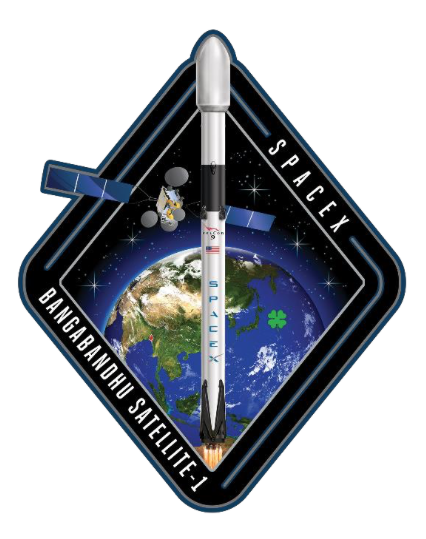 The Bangabandhu Satellite-1 mission served as the first flight of Falcon 9 Block 5, the final substantial upgrade to SpaceX’s Falcon 9 launch vehicle. Falcon 9 Block 5 is designed to be capable of 10 or more flights with very limited refurbishment as SpaceX continues to aim for reusability and reliability. 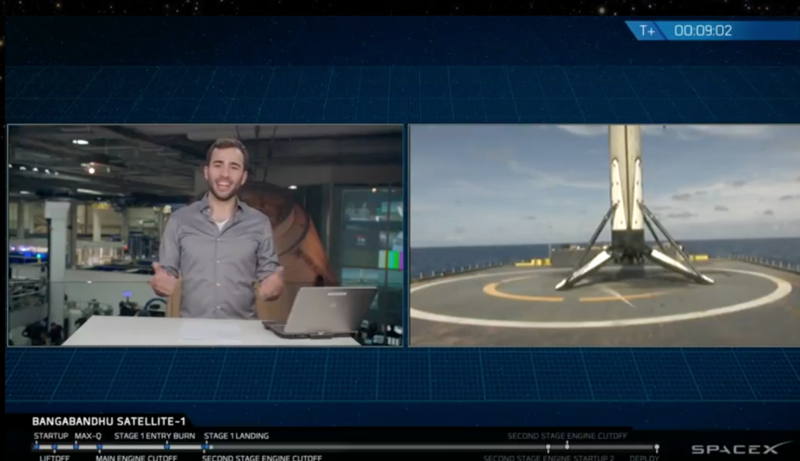 Following stage separation, SpaceX successfully landed Falcon 9’s first stage on the “Of Course I Still Love You” droneship in the Atlantic Ocean. The Block-5 is the first rocket from SpaceX to comply with NASA's standard for its Commercial Crew Program to carry agency astronauts to the International Space Station. But NASA still requires seven successful flights before the new rocket receives final certification for a manned mission. SpaceX chief executive Elon Musk says the improved boosters can be reused more than 10 times each and require little or no work between launches. Bangabandhu-1 will travel to a path 22,000 miles above Earth, where it will provide telecommunications coverage for Bangladesh and surrounding areas. Thales Alenia Space, the company that designed and built Bangabandhu-1, said in a statement that the spacecraft is a "historical first satellite" for Bangladesh. Bangabandhu-1 will bring state-of-the-art phone, radio, TV, and internet service to the nation of more than 160 million people, as well as surrounding countries like Nepal, Myanmar, and Bhutan. Bangabandhu Satellite-1 is Bangladesh’s first geostationary communications satellite. 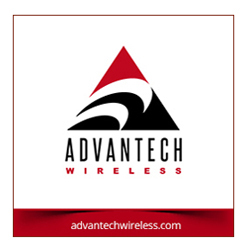 Development of the satellite program, known as the “Bangabandhu Satellite Launching Project,” was managed by the Bangladesh Telecommunication Regulatory Commission (BTRC) with technical support from Space Partnership International (SPI). The satellite, which is comprised of 26 Ku-band and 14 C-band transponders, was manufactured by Thales Alenia Space on the Spacebus 4000B2 platform and will be operated by the Bangladesh Communication Satellite Company Limited (BCSCL). Bangabandhu Satellite-1 has a primary service area encompassing Bangladesh and the surrounding region. The satellite will offer Ku-band coverage over Bangladesh and its territorial waters in the Bay of Bengal, as well as India, Nepal, Bhutan, Sri Lanka, the Philippines, and Indonesia. It will also provide C- band capacity for the entire region. Located at 119.1 degrees East, Bangabandhu Satellite-1 will provide direct-to-home (DTH) services, video distribution and very small aperture terminal (VSAT) communications across Bangladesh. The satellite will also provide broadband connectivity to rural areas throughout the country. Bangabandhu Satellite- 1’s mission is expected to last at least 15 years.